[112 pages Report] MarketsandMarkets estimates the predictive maintenance market to grow from USD 1,404.3 Million in 2016 to USD 4,904.0 Million by 2021, at a Compound Annual Growth Rate (CAGR) of 28.4% during the forecast period. 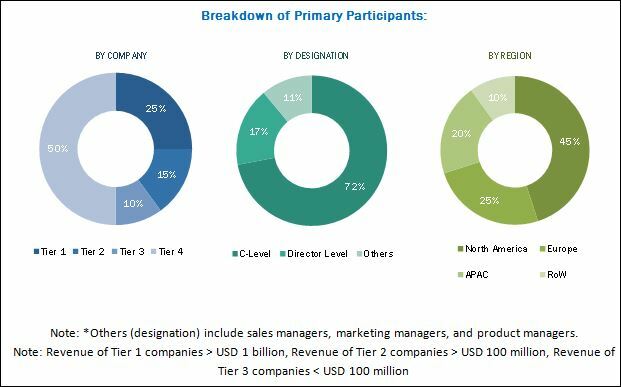 The main objective of this report is to define, describe, and forecast the market on the basis of segments that include components, deployment types, organization size, verticals, and regions. The base year considered for the study is 2015 and the market size is projected from 2016 to 2021. With the rise in focus towards reduction in operational cost, the demand for predictive maintenance solutions and services is expected to grow in the next five years. The report provides detailed information regarding the major factors influencing the growth of the market (drivers, restraints, opportunities, and industry-specific challenges). The report attempts to forecast the market size with respect to the five main regions, namely, North America, Europe, Asia-Pacific (APAC), Middle East & Africa (MEA), and Latin America. The report strategically profiles the key players and comprehensively analyzes their core competencies. This report also tracks and analyzes the competitive developments, such as Mergers & Acquisitions (M&A), new product developments, and Research & Development (R&D) activities in the predictive maintenance market. The predictive maintenance ecosystem comprises vendors providing predictive maintenance solutions and services to fulfill the maintenance needs of the government, aerospace & defense, healthcare, manufacturing, energy & utilities, and transportation & logistics. Companies such as IBM, Software AG, SAS, General Electric, Bosch, and Rockwell Automation adopted new product launches as their key strategy to enhance their market reach. This strategy accounted for the largest market share of the total strategies adopted by the market players. The predictive maintenance market is expected to grow from USD 1,404.3 Million in 2016 to USD 4,904.0 Million by 2021, at a Compound Annual Growth Rate (CAGR) of 28.4% during the forecast period. Several factors such as increasing demand for big data & Internet of Things (IoT) and focus on reducing operational costs are responsible for the growth of market. Verticals such as government, aerospace & defense, energy & utilites, manufacturing, healthcare, and transportation & logistics have boosted the market. 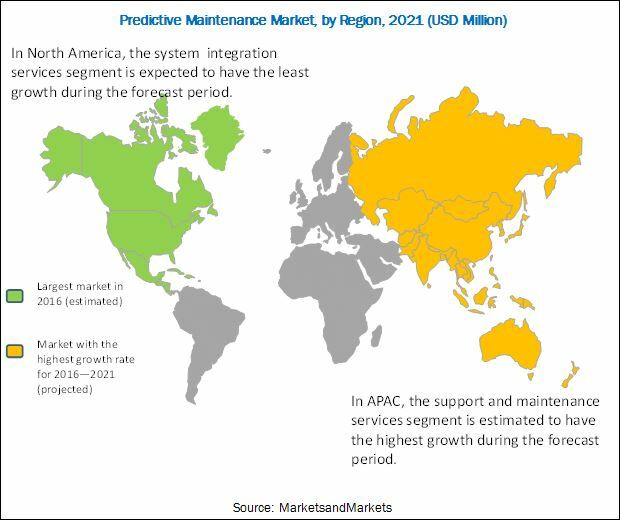 The predictive maintenance market is segmented by component, deployment type, organization size, vertical, and region. The predictive maintenance solution is expected to dominate the market, contributing to the largest market share during the forecast period. The market is also projected to witness growth in the system integration and consulting services segment during the forecast period. The support and maintenance service is expected to play a key role in the market and is projected to grow at the highest CAGR in the next five years. These services revolve around training the client’s workforce on how to use the solutions installed. The on-premises segment is expected to dominate the market in terms of market size. However, the cloud segment is expected to grow at the highest CAGR in the next five years. The common problems faced by the organizations that are trying to adopt predictive maintenance include lack of training provided to the operators and scarce availability of experts in the market. Furthermore, in predictive maintenance, skills play a crucial role as technicians, analysts, and engineers have to interpret the data captured by the predictive maintenance technologies. This can act as a major factor that restrains the growth of the market. The major vendors in the predictive maintenance market include IBM (U.S.), SAP SE (Germany), Software AG (Germany), General Electric (U.S.), Robert Bosch (Germany), Rockwell Automation (U.S.), PTC (U.S.), Warwick Analytics (U.K.), RapidMiner (U.S.), and SKF (Sweden). These vendors have adopted different types of organic and inorganic growth strategies, such as new product launches, partnerships & collaborations, and mergers & acquisitions to expand their offerings in the market.